In order to minimize disruptions and inconvenience, UT Dallas Facilities Management has scheduled several power outages during winter break for annual maintenance, inspections and cleaning of critical equipment. The Central Energy Plant (EP) and Satellite Utility Plant (SUP), which affect heating and air conditioning only, will be shut down from 9:00 p.m. Saturday, December 20, through Saturday, December 27. Several campus buildings will be without heating or air conditioning while maintenance work is performed. In addition, on Monday, December 22, the following buildings will undergo power outages for maintenance and inspections. All power, including electricity, will be out in these buildings during maintenance. No one will be allowed into the affected buildings during the power outages without prior notification and authorization of the UT Dallas Police. * Will be delayed if severe weather is forecast. Parking lots A, B, C, and D will be affected by the Loop Road extension. In partnership with the City of Richardson, UT Dallas Facilities Management will begin work to add a new segment to Loop Road in January 2015. Once completed, the new addition will cut through the center areas of parking lots A, B, C and D, and will connect into the existing Loop Road near Parking Structure 3 (PS3) and the Satellite Utility Plant (SUP). The project includes a new bridge near lot R and renovated road connections at W. Lookout Drive and at Facilities Way. Work on this project will be completed in phases, starting with parking lots A and B. Portions of lots A and B will be barricaded before January 5 to allow crews to start work. The affected lots will still be open for parking, but please be aware that there will be additional construction traffic and activity in the area. Once the road work is complete in lots A and B, the lots will be resurfaced, restriped and fully reopened. Crews will then begin work in lots C and D following the same process. Weather permitting, the parking lot phases of the project should be completed before the start of the fall 2015 semester. All phases of the project will be completed by late fall 2015. Construction will also continue on the North Mall enhancement project, slated for completion in spring 2015, and on the new Bioengineering and Sciences Building (BSB), slated for completion in late 2015. In addition, Facilities Management crews will be working in several buildings during the break to paint, refinish floors and complete needed renovations and maintenance. * Expect multiple short-term power outages. Please continue to check this site for updates on these and other projects. A small section of Rutford Avenue will be partially blocked. In order to complete welding work on the west side of Parking Structure 3 (PS3), a small section of Rutford Avenue will be partially blocked to allow space for the required equipment from Monday, November 3, to Friday, November 7, weather permitting. Signage, barricades and flagmen will be in place to direct traffic past the work area. Entrances/exits on the north side of PS3 will close, but all others will remain open. 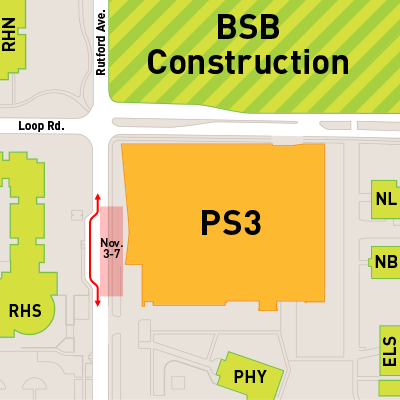 On Monday, October 20, crews will begin welding work on the north side of Parking Structure 3 (PS3). From October 20-24, the main entrance/exit to the garage will be closed to all traffic. 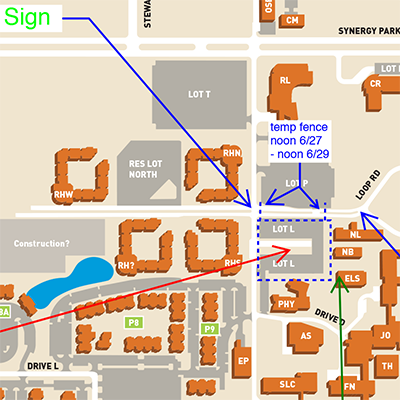 Signage and barricades will be in place to reroute drivers to the south entrance/exit, located between Parking Structure 3 (PS3) and the Physics (PHY) building. From October 27 - November 7, the sidewalk along the north side of Parking Structure 3 (PS3) will be closed to pedestrians. The north doors to Einstein Bros Bagels and the Parking and Transportation office will be closed. To access these areas, pedestrians should use Einstein Bros Bagels’ west door and the Parking and Transportation office’s south door. Pedestrians will still be able to utilize the east, west and south sidewalks around Parking Structure 3 (PS3). As welders work their way down the north side of the structure, sections of parking may be closed intermittently to allow crews room to work. A portion of Rutford Avenue will be restricted to one lane of traffic. 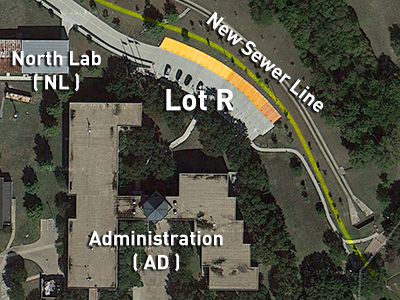 Beginning Monday, September 29 at 7:30 a.m., a portion of Rutford Avenue, located north of Loop Road and south of the Parking Lot T entrance, will be restricted to one lane of traffic for four weeks due to utility work for the new Bioengineering and Sciences Building. Within this timeframe, from October 9-23, this section of the road will be closed completely at night, from 11:30 p.m. to 6:00 a.m., and will reopen to one lane each morning. During the closures, access to Lot T will remain unaffected. Drivers should expect traffic delays and allow additional time to reach their destinations. Pedestrians are advised to walk on the west side of Rutford Avenue and cross at crosswalks. Signage, barricades and road flaggers will be in place to direct traffic. Weather permitting, Rutford Avenue will reopen fully by October 27. The front rows of Lots A and B (shown in red) will be closed. The front rows of Lots A and B will be closed, which will affect purple, orange, and gold parking areas. Vehicles may still be parked in other areas of Lots A and B. Lot I will be closed; alternate parking is available in Lot H.
Lot I (shown in red) will be closed; Alternate parking (shown in green) is available in Lot H.
Please plan accordingly and do not leave your vehicle overnight in lots or areas that are scheduled to be closed the following morning. We will continue to provide updates and reminders via this site, Facebook, Twitter (@UTDConstruction and @UTDallasParking) and email, as necessary, as necessary. For questions, please contact Parking and Transportation at 972.883.7777. With recent weather improvements, Parking and Facilities Management will begin work on the series of parking lot repairs this weekend. During the repairs, access to some parking areas will be closed, and it will be necessary for drivers to take alternate routes and find alternate parking. Please review the Campus Map and the below schedule of work to be completed, weather permitting. Please plan accordingly, and do not leave your vehicle overnight in lots that are scheduled to be closed the following morning. Lots A and B will be accessible only through the Lookout entrance; the Floyd entrance will be closed. Ring Road, which runs through portions of Lots A and B, will be blocked with cones to allow crews room to work; vehicles can still park in Lots A and B. Lots C and D will be closed completely during this timeframe. Crews will be milling to repair holes in Lots T, A and B; cars may still park in these lots, but some sections will be blocked off for crews and equipment. We hope to release the rest of the work schedule next week and will continue to provide updates and reminders via this site, Facebook, Twitter (@UTDConstruction and @UTDallasParking) and email, as necessary, as necessary. For questions, please contact Parking and Transportation at 972.883.7777. West side of Lot T will be closed; vehicles may still be parked on the east side of Lot T.
Res Lot West will be closed. Lot T will be closed. Please review the parking map, and plan to utilize other parking areas. Do not leave your vehicle overnight in lots that are scheduled to be closed the following morning. Parking and Facilities Management are planning to repair, seal and restripe several lots on campus in the next few weeks. During the repairs, access to some parking areas will be closed, and it will be necessary for drivers to take alternate routes and find alternate parking. Lots A and B will only be accessible through the Lookout entrance; the Floyd entrance will be closed. Ring Road that runs through portions of lots A and B will be blocked with cones to allow crews room to work; vehicles can still park in lots A and B.
August 7–8: east side of lot T and the south side of lot I will be closed for sealing and restriping; vehicles will be redirected to park on the opposite side of each lot. 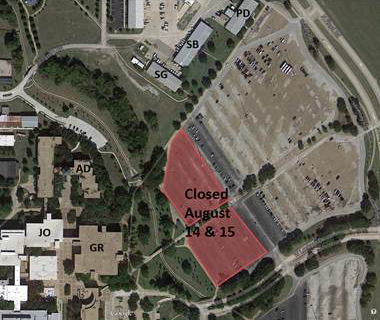 August 9–10: west side of lot T and the north side of lot I will be closed for sealing and restriping; vehicles will be redirected to park on the opposite side of each lot. Resident Lot West will be closed for sealing and restriping. 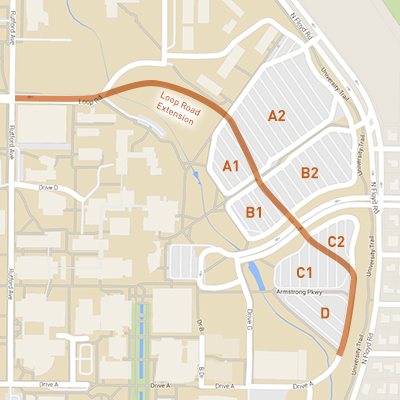 Ring Road that runs through portions of lots A and B will be blocked with cones to allow crews to work; vehicles can still park in lots A and B.
Reminders and updates will be posted to this site and announced via Facebook, Twitter (@UTDConstruction and @UTDallasParking) and email, as necessary. For questions, please contact Parking and Transportation at 972.883.7777. Pedestrians will need to use the east-side entrances of NL [North Lab] , NB [North Office Building] , and ELS [English Language Center] during this project. 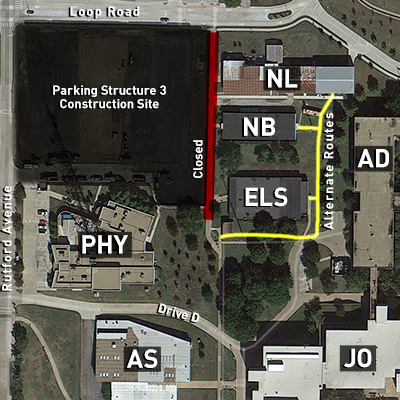 Beginning Monday, July 28, the sidewalk located off of Loop Road (shown in red) that runs between the Parking Structure 3 construction site and the North Lab (NL), North Office Building (NB), and English Language Center (ELS) will be closed to pedestrians for two weeks to allow crews to widen the pathway. During this time, only the east-side entrances of NL [North Lab] , NB [North Office Building] , and ELS [English Language Center] will be accessible. Pedestrians should plan to take alternate routes (e.g. : those shown in yellow) and are encouraged to allow additional time to reach their destinations. The sidewalk will reopen by Friday, August 8, weather permitting. 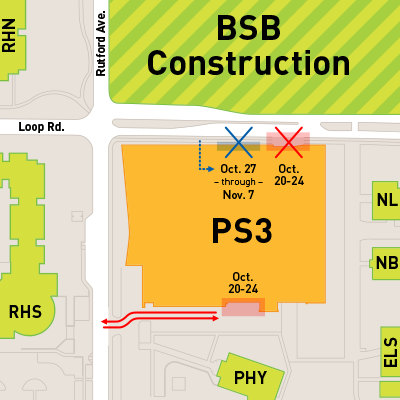 Two power outages have been scheduled for this week to give work crews a chance to perform electrical maintenance and provide power to the new parking structure (PS3) under construction on the north part of campus. The outages will impact only the buildings listed below and will not affect any emergency power systems. This building will be without power for the duration of the work period. These projects will not affect any other buildings on campus. Individuals who work or study in the affected buildings should plan to turn off their computers before each outage and avoid entering the buildings during these times. For more information, contact Facilities Management at 972.883.2141. From noon, Friday, June 27 through the evening of Saturday, June 28, the portion of Loop Road from the east corner of Rutford Avenue to the west corner of the Lot R entrance will be temporarily closed to pedestrians and drivers in order to allow crews enough space to safely disassemble a crane in the Parking Structure 3 construction project. Crews will also close the sidewalk that goes by the west side the English Language Center (ELS) on Saturday. Parking Lot R will remain open and accessible at all times through the Facilities Way campus entrance off of Synergy Park Boulevard. Crews plan to stage the area and set up a mobile assist crane on Friday and proceed with crane disassembly and removal on Saturday. Trucks will be entering campus from Synergy Park Boulevard onto Rutford Avenue to get to the project site. Pedestrians or drivers should be mindful of increased construction traffic in the area and are encouraged to take alternate routes. Signage and flag men will be in place to help direct traffic flow, but delays should be expected. If weather permits, the sidewalk and Loop Road will reopen late Saturday evening after the disassembly process is completed. The row closest to the apartments will be temporarily blocked. Work to add approximately 57 parking spaces in Lot J will begin the evening of June 23. To allow space for crews and equipment, a barricade will temporarily block the most western row of parking (along the curb closest to the apartments). The barricade will remain in place through mid-August. Lot J and all of its entrances will remain open and accessible during the project. On Friday, May 16, construction crews will be relocating an OFPC [Office of Facilities Planning & Construction] trailer. No roads will be closed, but drivers should watch for large, slow-moving vehicles on Synergy Park Boulevard and Facilities Way before noon. 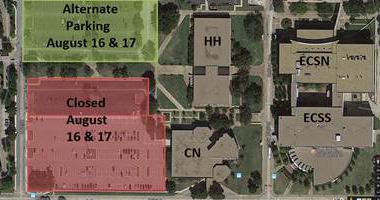 On Monday, May 19, workers will begin preparing for the June installation of modular buildings in the open area between parking lots H and I. Fencing will be placed in the area and will temporarily block portions of parking lots H and I.
Additionally, on May 19, crews will begin underground utility work for the Bioengineering and Sciences Building. To safely complete the project, crews will block portions of the south bound lane of Rutford Avenue and the west bound lane of Loop Road. This will be done in phases so that the roads remain passable via one lane, and there will be flagmen on hand to direct traffic. However, drivers should expect slow travel times and are encouraged to take alternate routes. The utility work is expected to be complete by May 30, weather permitting. Sections of Lot R shown in orange will be blocked off for safety as work on the new sewer line happens in close proximity to vehicles. Work will happen in three stages. 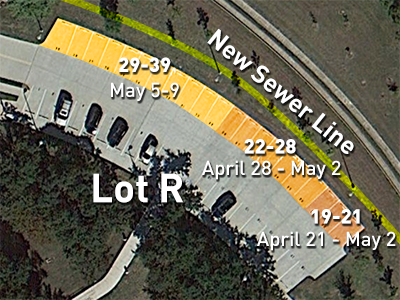 The green line shows the approximate path of the new sewer line. While work is underway, a temporary walking path will be created; It will eventually replace the current sidewalk when work is completed. Spaces 19-21 will be blocked April 21 - May 2. Spaces 22-28 will be blocked April 28 - May 2. Spaces 29-39 will be blocked May 5-9. 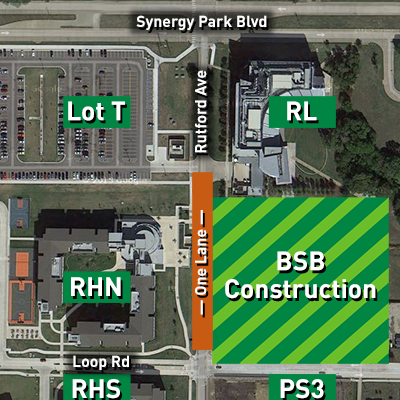 On Monday, April 21, 2014, crews will begin work to install a sanitary sewer line for the Bioengineering and Sciences Building (BSB) that will run from the building site to a connecting line near parking lot A. During the project, portions of parking lot R and the existing sidewalk from lot A leading to the Administration Building will be blocked for pedestrian and vehicle safety. Signage, barricades and a temporary path will be in place to reroute pedestrians during the project, which is expected to be completed May 9, weather permitting. The back row of lot R will be closed in three phases. Those with affected reserved spaces in lot R will be assigned temporary parking permits for designated spaces within the lot R visitor sections and will be contacted individually. Lot R parking spaces 19-21 will be blocked from April 21 - May 2; spaces 22-28 will be blocked April 28 - May 2; and spaces 29-39 will be blocked May 5-9. 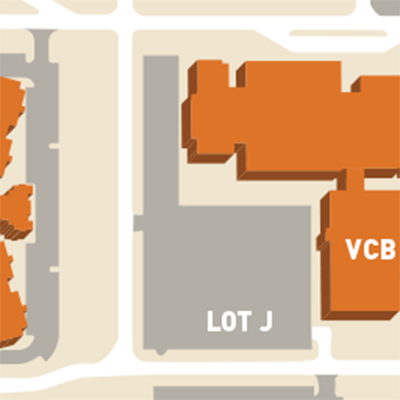 Any lot R visitor parking requests from April 28 – May 9 should be emailed directly to Elena Morten (eeg082000@utdallas.edu) and Tysh Coleman (klc076000@utdallas.edu). In order to perform routine maintenance work, power to the Satellite Utility Plant (SUP) and Parking Structure 1 (PS1) will be shut off from 12:30 a.m. to approximately 6:30 a.m. on Friday, April 18 (Thursday night/Friday morning timeframe). Drivers should note that, during this time, there will be no lights or elevator service in the parking structure. It is highly recommended that drivers plan ahead to park in a different area of campus or move their cars before the power outage begins. There will be Student Patrol Officers at the library and the garage to help drivers reach their cars in the garage, and pedestrian campus escorts may also be requested at any time by contacting the UT Dallas Police Department at 972.883.2222. As part of the water line work being done on the North Mall Enhancement Project, water will be temporarily turned off to the Administration Building (AD), Cecil H. Green Hall (GR), Cecil and Ida Green Center (GC), and Erik Jonsson Academic Center (JO) from 7:30 a.m. to 4:00 p.m. on Sunday, March 30. Please plan accordingly. The portion seen in red will be temporarily closed. On Thursday, March 13 from 12:01 a.m. - 6:00 a.m., a portion of Rutford Avenue (from Synergy Park Blvd. to the entrance to Parking Lot T) will temporarily close to allow construction crews time to replace concrete that was removed for utility work in support the new Bioengineering and Sciences Building. Parking Lot T will remain open and accessible at all times. Crews will have signage, lighting and safety procedures in place. Those in the area may experience some additional construction noise during this time. On Sunday, February 9, weather permitting, the UT Dallas facilities management team will work with contractors to move an air handling unit and exhaust fan to the roof of the Founders Building via helicopter. Normally a crane could be utilized, but due to limited space and the terrain around the Founders Building it wasn’t feasible. The air lift will take place between 7:00 a.m. and 9:00 a.m. and should be completed quickly. The flight path will run from the end of parking Lot B off Lookout Road, to the roof of the Founders Building. Beginning Friday, January 24 at 5:00 p.m., the westernmost stairwell facing the mall in Green Hall will be closed to pedestrians for approximately two weeks. Construction crews will be replacing the flooring and stair treads, as well as reconfiguring the stairwell doors. Please use the elevators or one of the other three stairwells in the building to reach your destinations. Overnight concrete placements are scheduled to begin this week at the site of Parking Structure 3, across from Residence Hall South. Once completed this fall, the garage will offer an estimated 410 parking spaces. 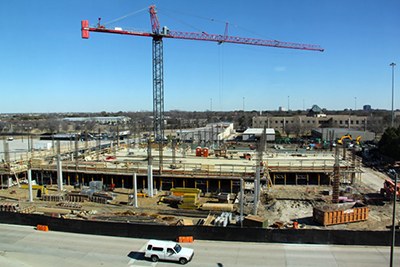 Construction crews are scheduled to start overnight concrete placement for Parking Structure 3 (PS3) this week. The first two placements will be Thursday, January 16, and Friday, January 17. Crews will begin at 2:00 a.m. and finish before 8:00 a.m. During the activity, Loop Road will have one lane blocked, and road flaggers will be on hand to direct traffic as necessary. Both lanes of Loop Road will reopen for traffic before 8:00 a.m. Please note, the PS3 project will have one or two overnight concrete placements each week for the next five months, weather permitting. Those on campus should expect some additional construction traffic and noise as a result. 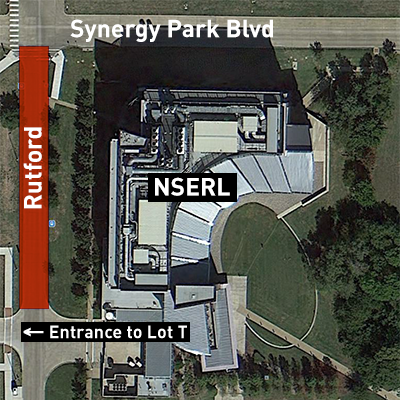 Asphalt sidewalks (illustrated in red) now surround parts of the Natural Sciences and Engineering Research Laboratory (NSERL) to accomodate traffic accustomed to using NSERL’s south entrance. The lab’s south entrance will close Thursday, January 9, as construction on the Bioengineering and Sciences Building begins. Effective Thursday, January 9, access into NSERL from the south will be closed due to construction of the Bioengineering and Sciences Building (BSB). From the west, please access the new temporary asphalt sidewalk that will take you around the east side to the courtyard. 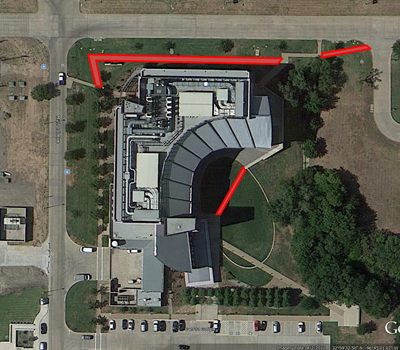 From the south, please use the existing sidewalk along the west side of the building and then to the asphalt sidewalk. Contact Kevin Masten for any questions or concerns at 972.883.4682.